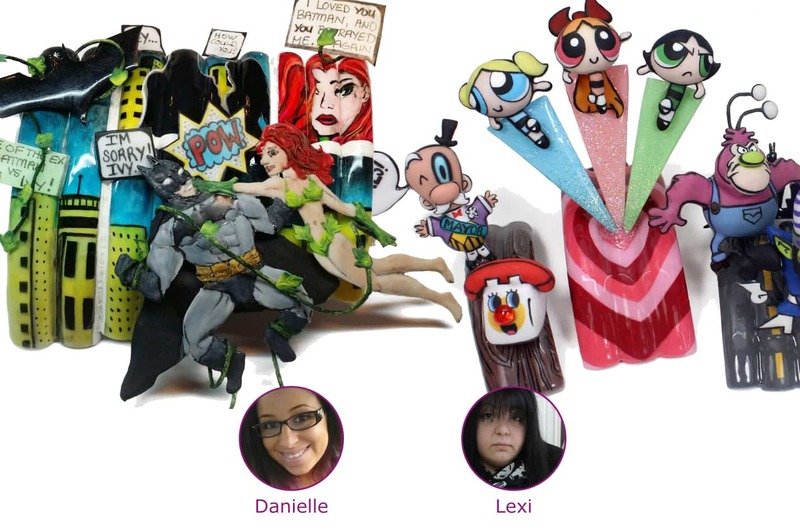 Challenge 9 sponsored by SuperNail asked our Top 4 to create 3-D sculptured comic strip nails depicting “Super Heroes & Villains” by utilizing all of the following materials: color acrylics, glitters, gel-polish, 1 unconventional tool to create the nail design (unconventional tools are defined as anything not nail-related, i.e. toothbrush, straw, masking tape, etc.). They were instructed to create their design across 10 nail tips lying side by side. This week’s guest judge was Marcy Shade of SuperNail. Permanent judges include CND’s Jan Arnold, NAILS Next Top Nail Artist 2014 winner Ryoko Garcia, NAILS editor Hannah Lee, NAILS senior editor Beth Livesay, and the rest of the team at NAILS Magazine. Danielle Costantino: The judges like how you created your comic book feeling. It really shows action and tells a well thought-out story. You used comic paneling the best of all of the contestants this week. Comic books often jump scenes from a wide shot to a tight shot to show reaction and you successfully recreated that effect by painting a close up on Ivy. We like that you painted your tips as a city where the action would take place, but we only see 9 tips instead of the required 10. We like the sculpted definition in your characters, but wish they were a little more 3-D instead of 2-D. The sculpted ivy touches are cute and really help tie the whole design together. Your patent leather bat is also a nice element. The captions could be neater and some of your detailing work could have been cleaner. We also would have liked to have seen your unconventional tool in action. We appreciate you trying to show us multiple steps and like the way you gave us a blueprint of your designs, but your photos are a little dark and not consistent. Lexi Martone: The judges love your overall design. It’s simply super cute. We like the interesting background designs on the nails. Your characters are perfect. They are crisp, clean, well-crafted, and 3-D. We also appreciate that you took our notes from before and sculpted in colored acrylic instead of simply handpainting all the color and details over white acrylic. The color palette and the black outlines are a really nice touch to making the characters look like hand drawn comic characters. We also love the mix of matte and glossy finishes. We wish you would have incorporated some comic paneling into the design. And perhaps more caption bubbles could have helped give your overall piece more of a comic story feeling so we would be able to follow the story. Good use of a soldering tool as your unconventional tool, we just wish we got to see a picture of that. We love that the nose lights up on the phone. This is the second time we’ve seen a Power Puff Girls design from you. We’re still hoping you’ll continue to push yourself to offer fresh, new concepts and designs. We want to see more from you! Your tutorial photos are great, but we’d like you to work on your written explanations to up your game. Lavette Cephus: The judges absolutely love your storyline and how you made it personal. We like your captions and use of comic paneling. The NAILS Magazine museum that lights up is detailed and cute (this needs to become a real thing!). The broken window is a really nice touch. The crossword puzzle is a nice detail as well. We feel like the majority of your story is handpainted with only a few 3-D elements. We wish more of your characters were sculpted and we would have liked to have seen your Batgirl have more dimension. She seems a little flat and more 2-D. We also would have liked more detailing on the handpainted portion of your design. There seem to be a lot of space in your design. We’re not sure what your unconventional tool is, maybe the light? But we don’t see anything about it in the tutorial. We also would have liked to have seen more instruction in your tutorial. Work on your written descriptions to help get your tutorial across to other nail techs. Simone Gilbert: The judges think your story is great and we love the captions and element of bringing nails into your story. We wish you incorporated more comic paneling into your design instead of focusing solely on the single piece of action. Great job using the fork as your unconventional tool (and thank you for showing it in use). The nail tip base is so graphic and bold, and while the glow-in-the-dark kryptonite is cool, we feel like there is too much goopy mess spreading out from it and it covers your lovely handpainted design. We love that you gave us true 3-D figures, but we would have liked to have seen more detail and contouring in your sculpted characters. We also wish you would have created them using colored acrylic, instead of just white and painting them. We love Superman’s gel cape (it really has good movement) and Wonder Woman’s lasso. You also did a perfect job with the comic sans font. We love the glitter boots on Wonder Woman and your tutorial.